The rental industry’s premier electronic payment processing system is Propertyware Payments, fully integrated and ready to make your life, and those of your tenants, owners and vendors, easier. Propertyware Payments is the industry standard, offering your tenants multiple payment choices to pay rent online including ACH through their bank account, check conversion and credit cards. Pay property owners and vendors quickly and easily, and receive funds anytime, safely and securely. Virtually eliminate processing checks by hand. Pay owner draws and distributions electronically with a single click. Propertyware Payments is powered by RealPage, which routinely processes more than $11 billion in payments annually, so you can be certain security is of the utmost importance. No more double entry or importing of data. Our online rent payment solution is completely integrated with owner and tenant portals and more. Propertyware offers real-time visibility for customers to view their ledger balances, anytime, from anywhere. 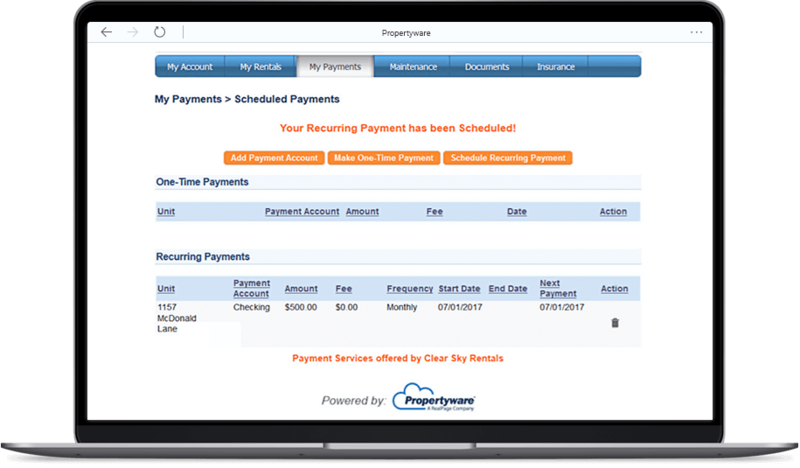 Propertyware Payments cuts down on processing time by enabling check scanning which automatically matches to your tenants. Also, our automated alerts remind tenants when their monthly rent is due, so you won’t have to. Validate whether to accept a tenant’s check prior to processing. Provide eviction and collection validation, too, helping to eliminate any chance of errors. Our real-time lease validation tool helps drive fewer mistakes, while saving you time and headaches. Propertyware Payments makes collecting rent a breeze for everyone. Now, residents can pay rent online anytime and anyplace, by credit or debit card, e-check or ACH and even cash using our RentMoney service. It’s convenient for them while relieving your staff of a big burden. And there are no transaction fees for you to pay! But what about renters who still want to pay by check? They’re no problem either. Your people just scan the checks and the system extracts the information it needs for the bank and your tenant ledger. No more data entry, copying, filing and trips to the bank.